IDW announced at New York Comic Con, that in association with Scholastic, they’ll be releasing the second three-issue arc in R.L Stine’s Goosebumps comic series. 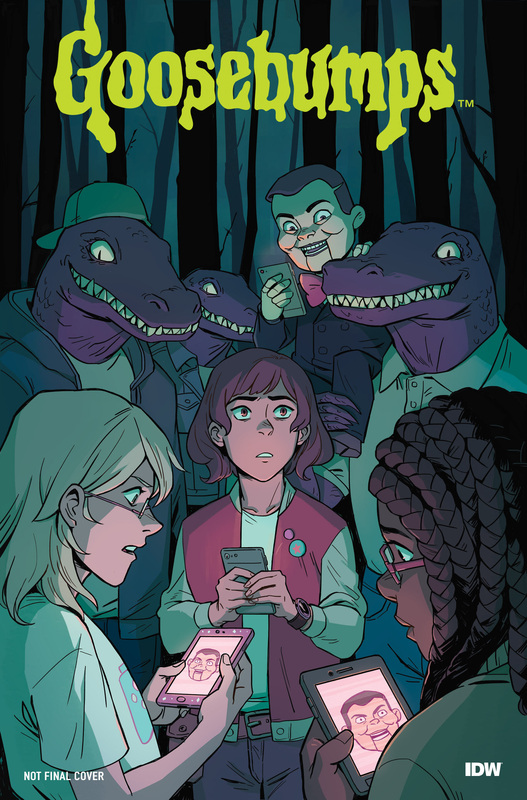 “DOWNLOAD AND DIE!” is a brand-new self-contained story set in the Goosebumps universe from the talented duo of writer Jen Vaughn (Adventure Time) and artist Michelle Wong (Tomboy). In the tradition of the classic “Say Cheese and Die!” story, this story takes that concept and puts a “digital spin on it for the iPhone generation”. A smartphone app that snaps filtered pictures which depict “nightmarish outcomes” is what these kids are up against. This Goosebumps tale is going to delve into what makes friends tick and what can drive them apart. What’s that saying, ‘you can always make new friends?’ Well, not when people find out what you did to your last ones. Michelle brought my characters to life so well…too well. They laugh, they cry, they dream, and bleed through the power of her lines. I’m terrified to read the comic now. Creepy stories are my favorite, and Jen is making this one so much fun to work with,” said Wong. “I love drawing cute characters, and I love drawing monsters – it’s a dream come true. “DOWNLOAD AND DIE!” will follow on the debut series, Goosebumps: Monsters at Midnight, from writer Jeremy Lambert and artist Chris Fenoglio, launching on October 25th, 2017, just in time for Halloween. “DOWNLOAD AND DIE!” launches in February 2018.